Announced during an education event in Chicago late last month, the iPad (6th generation) will go on sale in India tomorrow. Focusing on education and creativity, the 6th generation iPad features a 9.7inch display with support for Apple Pencil. Announced during an education event in Chicago late last month, the iPad (6th generation) will go on sale in India tomorrow. Focusing on education and creativity, the 6th generation iPad features a 9.7-inch display with support for Apple Pencil. The new iPad will be available in silver, space gray and a new gold finish, with a starting price of Rs 28,000 for the 32GB Wi-Fi, Rs 38,600 for 32GB Wi-Fi+Cellular model, Rs 35,700 for 128GB Wi-Fi and Rs 46,300 for the 128GB Wi-Fi+cellular variant. iPad (6th gen) features a 9.7inch Retina display with 264 ppi and weighs less than 500 grams. It is powered by the A10 Fusion fourth-generation chip with 64-bit architecture and M10 coprocessor embedded, which the company claims can easily handle augmented reality (AR) apps. Apple's App Store has a huge list of AR apps focusing on education, learning, productivity and even games, that can be downloaded on the iPad. Running iOS 11, it features a new Dock for accessing the favourite apps without exiting an app, multi-touch, drag and drop, and more. It comes loaded with a few apps including GarageBand, Keynote and iMovie. For documentation, Pages and Numbers can be downloaded from the App Store for free. The biggest upgrade is the support for Apple Pencil, that was earlier supported by the iPad Pro series only. Apple Pencil, that can be purchased separately for Rs 7,600, can be used for taking handwritten notes, sketching, drawing, and more for over 1.3 million apps including Notes, Pages, Numbers, Keynote and many third-party apps including Linea Sketch, GoodNotes, Word, Explain Everything and more. The Apple Pencil is able to replicate the experience of using a regular pencil by having thicker lines when pressed harder, thinner lines when pressed lightly, and more. It has a magnetic cap that hides the lighting connector, which can be plugged into the iPad for a charge. The new iPad also packs a five-element 8-megapixel rear camera with f/2.4 aperture, Live Photos, auto-focus and can record 1080p HD video. The device can also record slow-motion video at 720p resolution at 120 frames per second. Just like the other iPads, Apple claims that even this one can offer up to 10 hours of battery backup on surfing the web on Wi-Fi, watching videos or listening music. 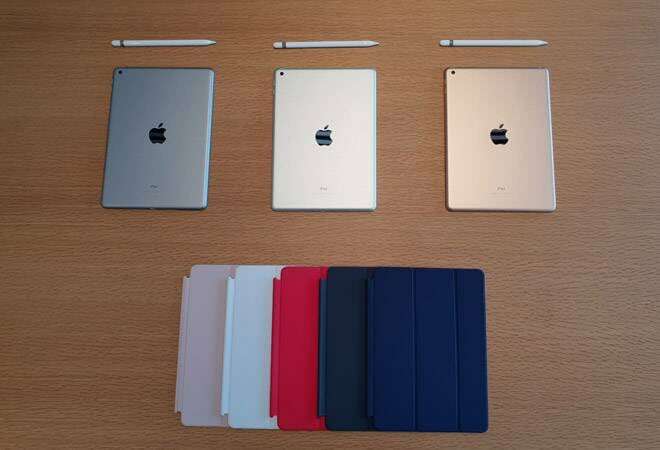 The Smart Covers for the iPad have been priced at Rs 3,400 and will be available in charcoal grey, midnight blue, (RED), white and pink sand.